The Future Of Content Marketing: Is Your Website Ready For Knowledge Vault? Since the beginning of the online information age, companies have relied on one thing to grow their business. Search engines have also relied on the same thing to help them grow and provide users with answers to their questions. Since 2013, Google has been keeping the SEO world on edge with discussions about Knowledge Vault. Now that the focus is on switching, marketers are scrambling to answer this question: Is your website ready for the Knowledge Vault? Go to Google and insert the query, is your website ready for the Knowledge Vault. You will find information on the topic, but it will not be what you are looking for. That is because up until this post no one tries to help you answer that question. But you will find tones of regurgitated information on what the "Vault" is. So why didn't I go all geek squad on you and explain in detail the difference between Knowledge Graph and Knowledge Vault? Simple! I did not want to waste your time. I did not want to flood search with another useless article. All those other posts do a great job of explaining the how and the why, but not what you should be doing. In case you have not read any of those articles, I will sum them up with one sentence. Knowledge Vault is the biggest knowledge based program that can learn without human interference. What does the shift to the vault mean for the future of your Content Marketing plan? If you are already doing it right, nothing! Schema markup is a small factor of the data used to form knowledge vault answers. Knowledge Vault combines knowledge-based information with the The Document Object Model. The (DOM) model is a programming interface (API) for valid HTML and well-formed XML documents. Meaning clean coding and sitemaps will play a huge role in the reach of your content. The vault will be using the DOM to extract triples to form information into answers for your search queries. Click the knowledge vault link in the first paragraph to learn more. Second and most important, you have to remember what the goal of Google is. Google exist for the end-user and their goal is simple. Provide the searcher with the most accurate and relevant answer to their query. 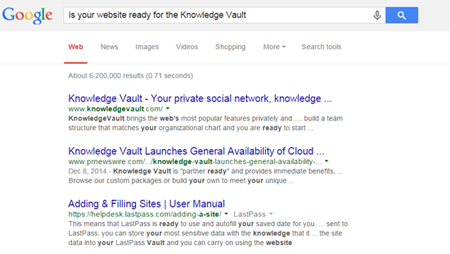 Now to answer the lingering question; is your website ready for the knowledge vault? You are only ready if you can answer no to the following questions. Is Your Website Ready For Knowledge Vault? Is your website built on scraped content from other sites? Do you type in your title headings and find majority of them are the same as everything else found in search results? Have you neglected to incorporate an XML site map? Do you refuse to clean up your code because you added schema and authorship? Are you still building pages that focus on a keyword instead of its long tailed counterpart? Are you using heading elements for design instead of developing semantic structure for your content? If you answered yes to any of these questions, your site is already suffering and it is certainly not ready for the shift to Knowledge Vault. Who wins after the Knowledge Vault Shift? Marcus Howling, The SEO Doctor, is a SEO specialist at Web Talent Marketing, one of the biggest full-service digital marketing firms in Lancaster. Marcus excels at on-page optimization, natural link building, keyword research, and analysis.